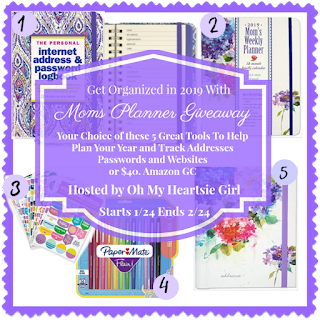 I’m joining Karren from Oh My Heartsie Girl for the “Moms Planner Giveaway”, these are great products to help mom get a handle on organizing and planning out 2019. There is a Planner from Peter Pauper Press, Internet Address Box also from Peter Pauper, Papermate pens and fun planner stickers from Peter Pauper. The Value of the Giveaway is $40 and if the winner cannot use these items they can choose a $40 GC from Amazon. Please remember to follow Karren and all the hostess so you can earn as many entry opportunities to ensure a win. Disclaimer: This giveaway is in no way endorsed, affiliated, or associated with Facebook, Twitter or any other Social Media Networking Site. Winners are chosen randomly by Rafflecopter program. The winner will have 48 hours to email their information back to karrenh at gmail dot com or a new winner will be drawn, you may want to put this email address as safe as it could go to spam. Once the winner is determined shipping will be set up or if Amazon GC is chosen the winner will be notified from Amazon with a GC notification. No blog associated with this contest are responsible for prize fulfillment. By entering you are authorizing us to collect the information on the form below, this information is used only to contact the winner! No purchase necessary, Void where prohibited by law, and the number of eligible entries received determines the odds of winning. If you would like to sponsor a giveaway contact Karren @ karrenh at gmail dot com. If you enter the contest you must follow all social media until the end of the contest to have a chance at becoming a winner. To enter use Rafflecopter follow directions.